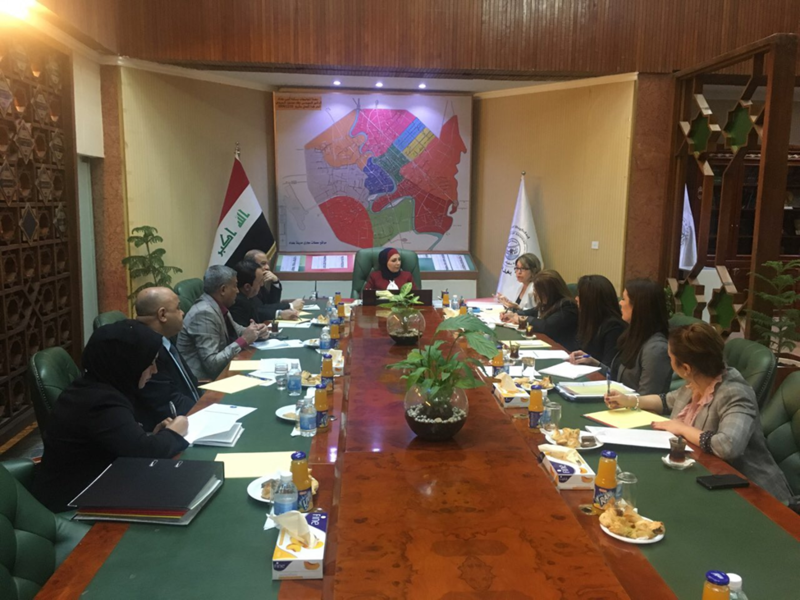 The last meeting of the Coordination of the CSTF for 2017 took place on 21st of December 2017 at the Mayor of Baghdad under the chairmanship of the Head of the High Commission for Women Development in Iraq. The main objective of the meeting was to follow-up the recommendations and outputs of the meeting of the CSTF on the 12th of October 2017. The meeting was attended by H.E. 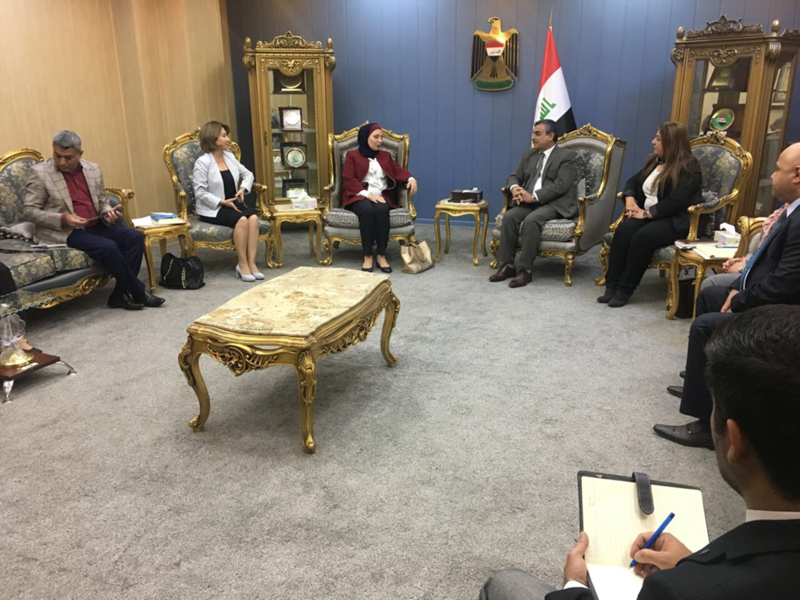 Dr. Thikra Alowsh, Head of the High Commission for Women Development in Iraq and Head of the Coordination Committee 1325 CSTF, Ms. Suzan Arief, Coordinator of the 1325 CSTF, Mr. Ameer Al- Kenani, Adivisor to the President of the Republic of Iraq and Chairman of the Legal Committee of CSTF, Ms. Seham Jabali, Assistant to the Head of the Foreign Affairs Department in KRG, Ms. Amal Jalal, High Council for the Women’s Affairs in KRG, Ms. Bushra Abbas, Advisor in the Ministry of Foreign Affairs in the Iraqi Government, Mr. Ali Abbas, Reconciliation Office of the Prime Minister, Mr. Amer Badir, Operation Room 1325/ Ministries Coordinator and General Secretariat of the Council of Ministries, Mr. Reyad Sediq, Representative of the Ministry of Interior in KRG and Ms. Vian Hisham, Department of Foreign Affairs in KRG. Ms. Boriana Jonsson, Executive Director of Euromed Feminist Initiative has sent her address to the meeting stating the scope of the support of the Euromed Feminist Initiative. The members of the Coordination of the CSTF discussed the agenda of the meeting, the training programs and the steps to develop the national report, which depends on the report of the ministries. They stressed on the importance of Iraq to be the first country in the MENA region that submit its report on implementing of the UNSCR 1325 as it was the first country which adopted a national action plan. They discussed the importance of establishing the Secretariat Office for the purpose of operationalizing and institutionalizing the work of the CSTF, documenting, following-up and M&E the implementation and reporting. Moreover, they emphasized on the need to allocate a budget to implement the national plan in 2018 and to start developing the second national plan for Iraq 2019-2023. The activation of the Legal committee of the CSTF 1325 was also discussed and finally, the importance of the National Conference to present the achievements through presenting the draft report of the government, planned to take place in February with the financial support of the British Embassy. The importance of presenting the CSTF report to the UN Security Council was also underlined. After the meeting, the Coordination team had a meeting with the Secretary General of the Council of Ministers and the Head of the National Team 1325, Mr. Al Alak, in order to highlight the important decisions and recommendations and to receive the approvals regarding the recommendations of the meeting. Mr Al Alak was informed of the next steps of the CSTF and the support of the Euromed Feminist Initiative to implement them. Establish a structure for the Secretariat. The location of the Secretariat: it should be linked with the Secretary General of the Council of Ministers and the Head of the CSTF 1325. Issuing a formal Divan order for the CSTF (national team) and the CSTF Secretariat as well a formal logo. Organize a meeting at the Council of Ministers of Iraq for the CSTF in order to present their achievements through inviting the team to attend a meeting with the Council of Ministers. Organize the National Conference in February 2018 in order to shed light on the achievements of the CSTF and to present the report of the government as well as the financial and technical support of the Euromed Feminist Initiative. Organize a joint training for the national teams of Baghdad and KRG regarding, following up, M&E and enabling the reporting. Organize a meeting with the Financial Committee of the Iraqi Parliament in order to provide financial support to the NAP and the CSTF with the Secretariat. Nominate some individuals from the Legal and Women committees in the Iraqi Parliament, High Commission of Human Rights and NGOs in order to join the legal committee of the national team.